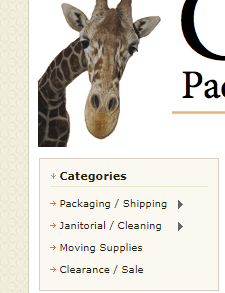 We now offer two different ways to shop with Giraffe Packaging! One way is for our local customers (Gulf Coast of Florida), and the other way is for all of the customers outside of our local delivery zone. First, for all items stocked in our Bradenton warehouse, use the categories on the left side of the page. These categories will take you to all of the items that we stock in Bradenton, Fl. You can order them online and either pick-up at our warehouse, or have them delivered by one of our local delivery trucks. If you live outside of our local delivery zone, then you can visit our other shopping website HERE. This website has a huge selection of items that can be shipped via UPS or Freight Liner.